Welcome to the La Mesa Rotary! Thank you to everyone that participated in our 1st Annual 5K and Family Fun Day at Lake Murray Park on Saturday April 8th! A great time was had by all. Special thanks to Becki Schwartz and her team for putting this event together! Please fill out a Participation Form. We have a number of options for Sponsors - please see our Sponsorship Form! Also please fill out the forms you will find to the right under Download Files. 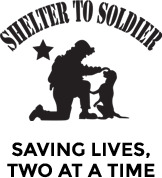 Graham Bloem the founder of Shelter to Soldier will be speaking about the work of the charity. This is a CA 501c3 nonprofit organization that rescues dogs from an otherwise uncertain future in local shelters and trains them to become psychiatric service dogs for post-9/11 combat veterans suffering from Post-Traumatic Stress Disorder (PTSD), Traumatic Brain Injury (TBI) and/or other injuries associated with traumatic service experiences. Every day, 22 US veterans and 1 active duty service member are lost to suicide. That’s an average of one life lost every 63 minutes. The suicide rate among the nation’s military personnel has spiked this year, eclipsing the number of troops dying in battle and on pace to set a record annual high since the start of the wars in Iraq and Afghanistan more than a decade ago. The links below are for an impact report, a video and the last link is to a page showing the body parts and how you can donate. 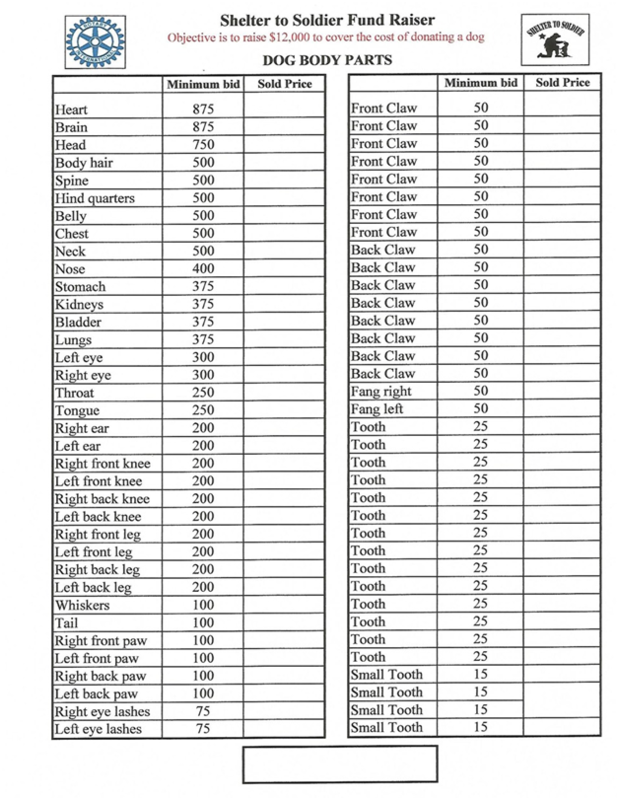 At the meeting Rob Ridge and Mark Matthews will be selling “ dog body parts” to create a complete dog. The objective is to raise $12,000 to donate a dog for a veteran, for which there is a desperate need in this area that has so many returning military personnel. Note: You can now donate through the La Mesa Rotary website as well! Go the La Mesa Rotary Foundation Web Payment Portal to donate now! Comedy Hypnosis Show a Roaring Success! 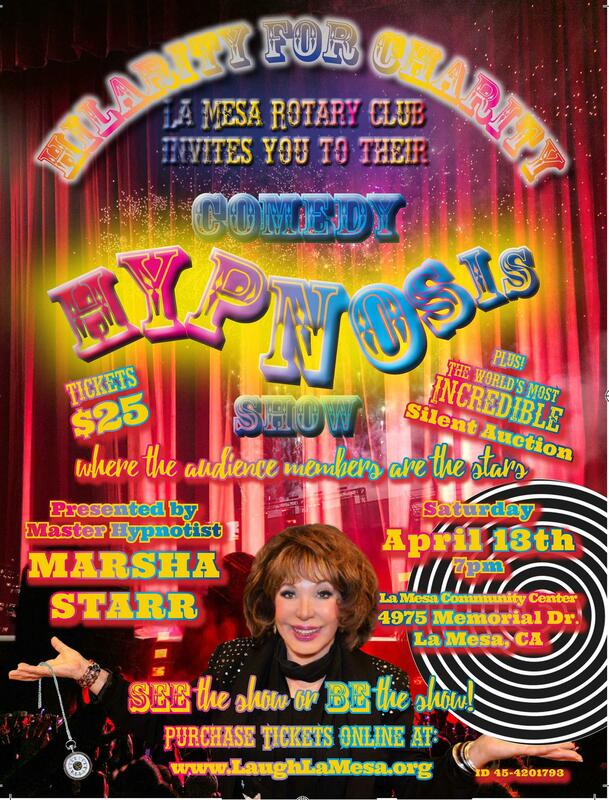 Comedy Hypnosis Show sponsored by La Mesa Rotary! 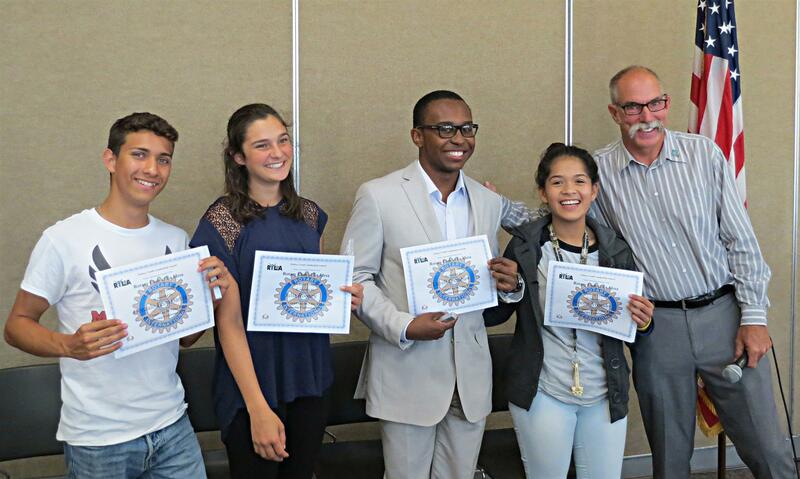 La Mesa Rotary supports the youth of East County and Baja! Over the past year we have supported many youth programs in La Mesa, East County and even Baja! We start the year with our Dictionary Project where we provided every 3rd Grader in the La Mesa / Spring Valley school district with their own Dictionary. We support Grossmont High School and Patrick Henry High School Interact Clubs. We have the Bill Kalt Scholarship Program at Patrick Henry High School. This committee picks two new Freshman each year and helps mentor them through high school. Upon graduation each is given a check for $2,000 towards further education. Rotary RYLA - a weekend camp for high school juniors chosen as class leaders. La Mesa Rotary sponsored 8 juniors to go to this year's LEADS weekend. La Mesa Police Youth Leadership camp. Door of Faith Orphanage - we were able to visit this orphanage in Baja and bring them supplies and help rebuild thrier laundry room.